It doesn’t take much to motivate me to hop on the train and head south to Portland. Though some motivations are more pronounced than others. As was the case last week when rock-star butcher Dario Cecchini was in town. Soon as I’d heard word of his pending visit a few months back, I’d been inspired to see the man work. Not because I’m a butchery fanatic. But because I’ve come to relish any opportunity to gain first-hand, direct insights into the character and craft of a person as singularly talented and accomplished as Signore Cecchini. Another example, another genre — but I had similar feelings about the opportunity to hear documentary filmmaker Ken Burns speak in Seattle last summer. I found it fully invigorating to hear the bright, thoughtful, inquisitive, creative man talk about his work, the process of research and telling stories, the human aspect that he and his cohorts employ to bring understanding to large and complex themes of American history (Jazz , Baseball , Prohibition, among many ). I’ll admit right here that I really didn’t know a whole lot about Dario and his butcher shop, the Antica Macelleria Cecchini and the bucolic little nook of Tuscany that it inhabits. I haven’t been following his career for years, I haven’t even cracked open that copy of Heat that I own, in which author Bill Buford treks to Tuscany to learn from Dario (among other apparently colorful culinary adventures, it’s rising on my reading list). But I knew as much as I needed to: that it was going to be well worth a couple days away from home to see him in action. And it was. Was it ever. 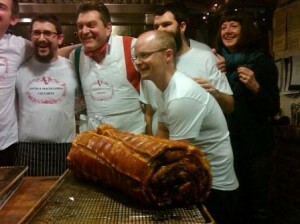 And not only for the baseline value that I’d anticipated: a greater appreciation of the art of breaking down a pig. I really wasn’t prepared for being taught about life along the way. The day began with a highly instructive demonstration by Dario of how to cut a pig into its delicious components to be used for myriad preparations, from glistening thick fat to be cured for lardo, to prime chops from the loin, ideal for grilling. The demo was live-streamed that day, and the video’s available here if you’d like to catch up. Nearly two hours, but lots of amazing techniques and stories, a worthwhile viewing. Friend, cookbook author, teacher and fellow Tuscany denizen Faith Willinger did a fantastic job of translating not only Dario’s words, but his passion as well. I don’t recall ever before watching a culinary expert who dished out such profound considerations while going through the mechanics of technique. Maybe “profound” isn’t quite the right word, nor is “deep” nor “philosophical.” Those sound too grandiose. But what he’s doing as he draws the blade of his knife through the fat and sinew and flesh of the pig is clearly far more meaningful to him than producing an outcome of a chop or a roast or a pig’s foot to split and slather with garlic and rosemary. He’s contemplating culture and community and history and craft every step of the way. One example: While working on the hind part of the beautiful animal (half of a beautiful 300 pound pig from Square Peg Farm in Forest Grove, Oregon, selected just for this occasion), Dario spoke of the curing process for prosciutto. He went on to explain a Tuscan tradition, that of sharing the bone that remains when the bulk of the glorious meat has been carved away. Still plenty of salty-savory flavor remains. Enough, definitely, for a pot of soup for the family. But the bone has more than that to offer. The bone can be used 6, maybe 7 times, simmering in a pot with beans or meats or vegetables, to lend its bold flavor. It’s tradition to, therefore, share the bone with your neighbors, lend it to them for their soup pots. Don’t just keep it for yourself. Sounds like the Golden Rule of prosciutto, if you ask me. At the end of the demo, during a Q&A portion, one of the chefs at the back of the room asked a question about his knives. There were five or six off to the side of his work table, I don’t recall how many of them he’d used that morning, maybe just two or three. But she was, rightfully, curious if he had any recommendations about the type of knife to use for the kind of butchery we’d just witnessed. The master butcher just shrugged. “For a while, I was obsessed with knives,” he begins, saying that for months on end he was in pursuit of the perfect knife, the right handle, the ideal blade, the right this, the ideal that. Then he had a revelation. That no matter what knife he picked up, it wasn’t going to change what his hands were capable of doing with the knife. The perfect knife was not going to make him a better butcher. His endless pursuit ended. And he uses good, nondescript, sturdy, nothing-special knives. And reminds us all, in that simple answer, to focus on our own hands, our own minds, our own skills, and what we can do with them. No slick tools of any kind will change what, at our cores, we have to offer. Oh, the lessons we learned that morning! It was golden, I relished every moment. The magnificent dinner that night at Nostrana itself was a showstopper and icing on the cake — in particularly the glorious “La Mia Arista,” a signature of Dario’s explained here — that was produced before our eyes that morning. A twinkling, buzzing room, opera singers, phenomenal food, amazing wines from Fontodi, with vineyards just south of the town of Panzano where Dario’s shop is located. Giovanni Menetti from Fontodi was part of the dinner, another treat of the evening. Dario is famously passionate about Dante’s works. So it was little surprise that Dante worked his way into the conversation over the beautiful pig that morning. But that was nothing compared to what we witnessed at dinner. The group had been serenaded by two opera singers throughout the evening. Dario had been asked if he was going to regale us in song as well? No. 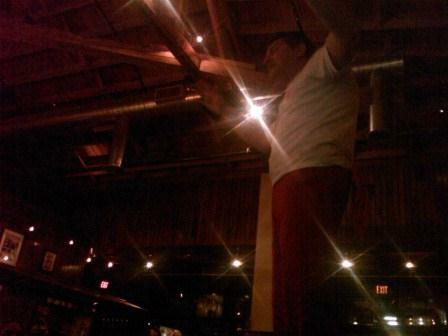 But perhaps…..
Then, just before dessert was brought out, Dario climbs up on the table and addresses the crowd. Not in song, but in recitation of a passage from Dante’s The Divine Comedy. A recitation deeply infused with passion and exuberance and full devotion to the story. He told us, through his wife Kim, that no translation would be provided, but that none would be needed. Indeed. One final lesson. Communication comes in many forms. Listen and observe and you’ll follow the story being told. Searching and anguish, love and redemption. A day made very rich by a most amazing and delightful butcher from Tuscany. You have to start telling me about these events, this sounded like so much fun. I am so out of the food world right now as the preschool world as taken over. Is their a video to go along with that yummy pig? experienced it with you. Great job, Cynthia. Egads I would have hopped a train with you;) I REALLY wanted to go see Dario, but we were out of town!!! 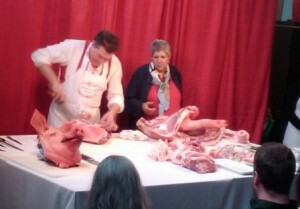 I met him in Italy and adore butchery;). Happy you went!